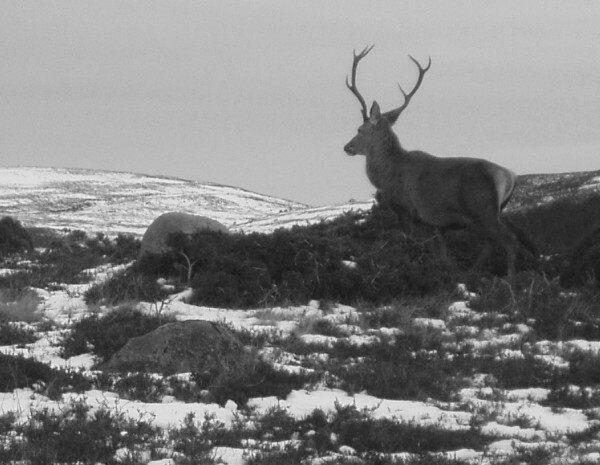 Since the Trust's acquisition of the estate in 1995, the primary focus of management has been in reducing the red deer numbers to allow regeneration of the native pinewood and sustainable management of heather moorland. Grazing levels have been high for the last 100 years and consequently few young pine trees can currently be seen within the woodland. In 1995, 3350 deer were counted on the estate and the aim is to reduce the deer numbers to 1650 by the spring of 2005. For deer management purposes the estate has been split into two zones. The regeneration zone forms the eastern part of the estate where 800 hectares of remnant Caledonian pinewood is situated. The target deer density for this zone should allow for successful tree regeneration. The moorland zone forms the western part of the estate and in this area the target deer density should maintain the moorland in favourable condition. Fencing has a negative impact on landscape and public access. Reducing the deer population has not been easy and nor has it been without controversy. We currently await the result of a deer count conducted in February 2005. We believe the Trust is now close to its target deer population and we should start to see a response from the trees seedlings that are being monitored closely. Encouragingly we are already seeing a response from the heather as a result of the reduction in grazing.